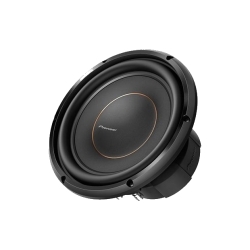 10" 4-ohm subwoofer injection-molded polypropylene cone ribbed foam surround suitable for free-air use power handling: 50-300 watts RMS peak power handling: 600 watts frequency response: 30-500 Hz sensitivity: 86.2 dB top-mount depth: 4-3/4" sealed box volume: 1.00 - 2.40 cu. ft. ported box volume: 1.25 - 1.75 cu. ft.